The Ras family of small GTPases were originally discovered during a search for oncogenic retroviruses. Named for their ability to cause rat sarcomas, human RAS genes were identified in 1982 and have been the subject of intensive cancer research ever since . Subsequent research on Ras revealed numerous related genes and eventually the discovery of the superfamily of small GTPases, made up of the Rho, Rab, Ran and Arf proteins. Ras GTPases function as molecular switches, alternating between the active GTP- and inactive GDP-bound state. Often located near the plasma membrane, Ras proteins are activated by extracellular stimuli, whereupon they interact with downstream effectors to regulate signalling pathways for diverse biological processes, in particular cell growth, survival and differentiation. The classic Ras signalling pathway starts with activation of Ras by the epidermal growth factor receptor tyrosine kinase. 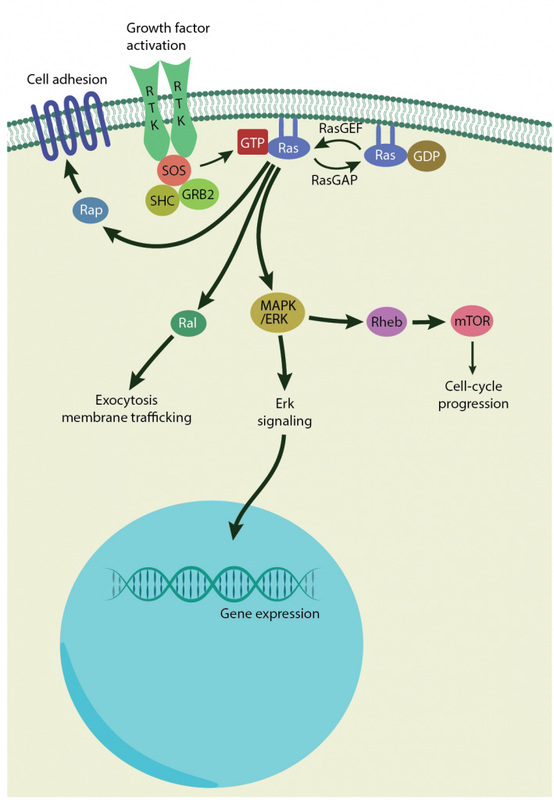 The activated Ras sets off a signal transduction pathway which ends up with the activation of the MAP kinase ERK1, which translocates to the nucleus to induce gene expression. Ras family members are involved in many cellular processes. In terms of mechanobiology, Ras GTPases are involved in cell adhesion, membrane trafficking, and apoptosis. Given their origin, members of the Ras family are commonly associated with cancer. Ras mutations are often oncogenic and are found in 10-20% of human cancers . However, Ras GTPases have also been implicated in wide variety of mechanobiological processes, based on their ability to act as a signal transduction node . The Ras subfamily of small GTPases can be further divided into various branches, with different functions. 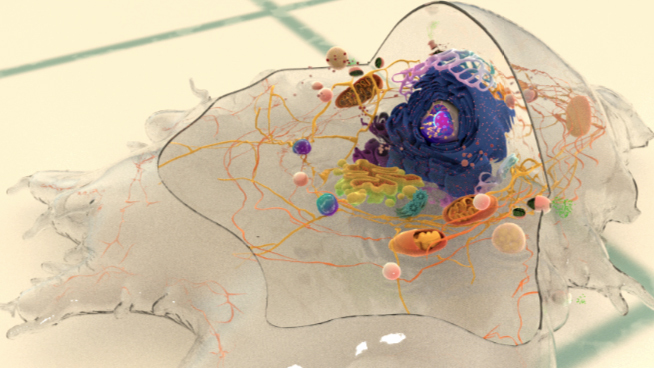 The original Ras proteins regulate cell growth, survival, differentiation and apoptosis. The Ral subfamily mediate GTP-dependent exocytosis, Rap proteins are involved in cell-cell adhesion and cell-matrix adhesion, Rad proteins play a role in remodelling cell shape and the cell cycle, and the Rheb subfamily, which is thought to regulate cell growth and cell-cycle progression via the mTOR pathway. Recently a novel branch has been identified, Rit, which localises to neurons and affects neuronal differentiation and survival . RasGTP can be activated by the Ras guanine exchange factor, Son of Sevenless (SOS). Visualisation on individual SOS proteins revealed that it changes shape depending on whether it is bound to RasGTP or RasGDP. When bound to RasGTP, it can shift into a highly active conformation which can subsequently activate multiple Ras proteins . Intriguingly, Ras-driven tumourgenesis has been linked to increasing stiffness of the tumour microenvironment, via integrin-mediated mechanotransduction and gene expression .